A unique summer art show featuring eight northern painters took place in Wigan on the 19th and 20th June 2010. The show-piece of the two day event at Wigan Town Hall were paintings by Wigan’s J Lawrence Isherwood and Appley Bridge’s Theodore Major. But other artists – some well known and some striving to make a name for themselves were also on show on the Saturday and Sunday. 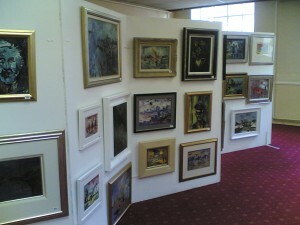 The show was organised by David Myers on behalf of a group of Northern Art enthusiasts. David said: “The northern art scene is not just about L S Lowry. There are a number of equally talented painters here, painters who haven’t been taken up by the art establishment to the same extent ,yet whose work is superb. Isherwood’s record auction price – for an oil of a country scene in Devon – is £7,200 while Major, who always refused to co-operate with the art world during his lifetime, regularly sells for £20,000 and more. Arthur Delaney concentrated on Manchester scenes, and his “tram” paintings are in demand, while Reg Gardner concentrates on warm impressionist urban scenes. Oldham’s John Thompson is in his 80s and still actively painting his lively and much admired groups of figures. Following his untimely death in 2001, Trevor Grimshaw’s graphite drawings of idealised urban and rural landscapes are becoming increasingly sought after while his much scarcer oils are also widely admired. Adrian Johnson is a prolific and talented artist who has been shown at the Turnpike Gallery in Leigh. His focus is on portraiture using a very vivid palette and thickly applied paint. Also available at the show were the last handful of copies of the hard-back book on Isherwood by collector Steve Eckersley. The edition ran to 250. Theodore Major knew Lowry and exhibited with him in Manchester in the 40s. Lowry bought an Isherwood oil entitled “Minnie Small with Black Cat” which he hung on his studio wall in Mottram-in-Longdendale. 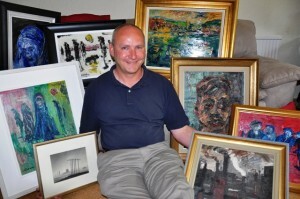 The show was very well attended with a high number of works being sold.